Our selection of Gourmet Coffee & Tea Gifts are sure to please even the most discriminating Coffee & Tea Drinkers! 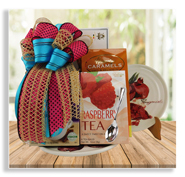 A coordinated gift box and mug set for coffee or tea sippers. This elegant floral porcelain tea pot is actually a teapot, teacup and saucer ensemble for one. Perfect for the tea connoisseur. 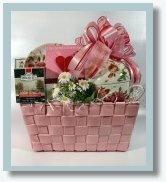 Starbucks coffee, biscotti, candies and more! A beautiful ceramic plate presentation with cookies, tea, chai tea latte and caramels.